Are you concerned about the flat roof at your home in Rio Rancho, New Mexico, or a surrounding area, not providing you with adequate protection during periods of intense rains? If so, turn to the professionals at ABC Seamless of Albuquerque for the installation of custom-made parapet caps to prevent long-lasting moisture from occurring on the parapets of your home. At ABC Seamless of Albuquerque, we will create a maintenance free solution on your parapets so that you will never need to worry about moisture infiltration. And, if you’re concerned that we won’t have a size that works for your home, we are able to create caps in a wide range of sizes including up to 30 inches in length. 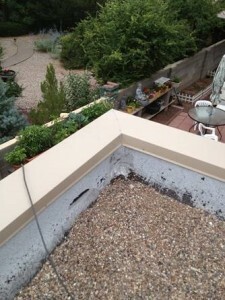 In addition, at ABC Seamless of Albuquerque, we are able to install much more than just highly effective parapet caps. In fact, we are also able to provide local homeowners with durable gutter guards and functional seamless gutters. Our reliable gutter systems are made with the same seamless steel used throughout the rest of our home improvement products and when paired with a Gutter Topper gutter guard, you will be able to rest assured that all leaves, twigs, and debris remain out of your gutters. For more information about how our custom-made parapet caps can protect your home in Rio Rancho, NM, or a surrounding area, contact ABC Seamless of Albuquerque today. Make sure to ask about the convenient financing options available to all qualifying homeowners.